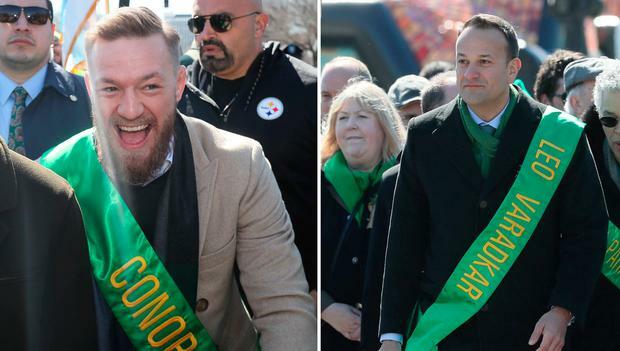 Taoiseach Leo Varadkar has said he “wasn’t specifically walking” with MMA fighter Conor McGregor when they lined up at the front of St Patrick’s Day parade in Chicago. The Taoiseach has tried to distance himself from the controversial Dubliner who he said has had “some trouble with the law”. However, he defended a photo-op with movie star Arnold Schwarzenegger during a previous trip to America. Although never convicted of a crime, Schwarzenegger has previously apologised for having “stepped over the line several times” with women. He denied going to “great lengths” to avoid being photographed with McGregor in Chicago. “Conor McGregor was there I believe at the invitation of the plumbers’ union,” he said.